The Director's Cut on Amazon.com! 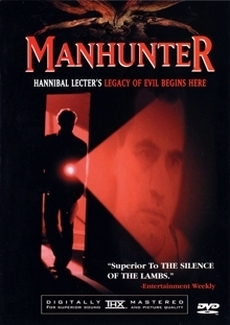 The limited Two Disc Set of "Manhunter", released by Anchor Bay", contains two versions of the movie – a remastered Theatrical Version and a non-remastered Director's Cut. Later releases in the USA and UK contained a remastered Director's Cut. According to the IMDB the Theatrical Version is different from other Theatrical Versions, hence the name Anchor Bay theatrical cut. Both versions have their advantages and disadvantages. The DC features completely new storyline scenes but misses numerous little sequences that are only in the Theatrical Version. All in all the DC is missing three minutes of footage, so it is advisable to own or at least watch both versions. Also, despite the "Unrated" sign, the DC is in no way more brutal than the theatrical Version. Quite the contrary – the finale is a lot more explicit in the Theatrical Version. Comparison between the Theatrical Version on the limited US-DVD from Anchor Bay and Director`s Cut on the same DVD. The DC is missing 17 scenes, running approximately 178 Sec. (= 2 Min. 56 Sec.). The Theatrical Version is missing 7 scenes, running approximately ca. 509 Sec. (= 8 Min. 29 Sec.). The opening credits are different in both versions. Graham watches videos of the murdered family. The DC is missing a scene in which Will Graham uses an elevator in his hotel. The movie jumps directly to the video. Again, the DC is shorter. Also, some of Grahams lines have been rearranged. In the DC he talks about how it would have taken less than a minute to kill Mrs. Leeds and the children right at the first shot of the video but a bit later in the Theatrical Version. The first shot of Graham in front of the television is longer in the Theatrical Version. He talks about how the killer has smashed the mirrors in the house and used the shards to mutilate Mrs. Leeds. During this, the movie cuts back to the video showing some scenes of the family that are missing in the DC as well. Sometimes the cutting of excess footage can enhance the pacing, but why the DC is missing part of the investigation is beyond me. Graham walks down a hallway with two men. One of them tells him they're sure the murderer has worn gloves the whole time. After Graham has called for the fingerprint expert the scene changes and the Theatrical Version shows the man telling the cops about the teethmarks. The DC starts earlier. When Graham is told that the killer has worn gloves the whole time he says that the report says nothing about the eyes. Upon being asked why he thinks that the killer had taken his gloves off Graham responds that Mrs. Leeds was a very beautiful woman. Now we cut to the briefing room. Several policemen are just arriving, others are present already. The man in the front tells them that the interrogations are expanded over four more blocks. He then calls forth a Dr. Brinston who steps forward to the podium. Now both versions are identical again. After Brinston has finished, the DC features alternative footage as well as a new scene. The Inspector is seen in alternative shots for the rest of the scene. The Inspector begins to hand out various tasks to the policemen. Part of this is heard from the off while we see Graham and his friend. In the DC the task are passed out a bit later and the Inspector is seen the whole time. The shot of Graham and his friend is missing in the DC. The Inspector talks about how Graham has dealt with this kind of crime before and calls him forth. Graham goes on about the killer having a bright imagination which they must understand if the want to catch him. Being asked what the killer's imagination consists of, Graham replies that he doesn't know and that this is all he has. After this completely new scene the DC shows the Inspector briefing the cops, albeit in a different take. He is seen the whole time and nobody speaks from the off. There is no cut, tis scene belongs to the scene with Graham. When the Inspector says that he doesn't want to hear the nickname “Tooth fairy” in public, both versions are identical again. The 7 Sec. from the Theatrical Version are not in the DC, except for the dialogue, only during alternative footage. After the briefing the Inspector talks to Graham about how they don't even know the killer's motive, to which Graham replies that it can be found in the killer's dreams. The inspector asks again. Up to here both versions are identical but now the DC is missing Graham's answer about the murderer's imagination and the Inspector asking again. Probably removed because of the longer scene earlier in which Graham already talked about the killer's imagination. In the Theatrical Version the dialogue about Lecktor is cut very sloppily. After the Inspector asks what happened to the two survivors of Lecktor's attacks we get a cut and the Inspector says something completely out of context. In the DC, Graham answers the question and is further asked what they psychologists thought of Lecktor, to which he answers that they called him a psychopath for lack of a better term. As Graham's friend from the FBI appears, both versions are identical again. Graham is in his hotel room when his wife calls, telling him that she wants to paint the kitchen and asking which color he would like. After rejecting some of his suggestions he snaps at her but apologizes right away. This part shows in a very believable manner how Graham's work is effecting him. His wife is silent for a moment, then apologizes herself and tells him that she only called to say that she loves him. In the psychiatry, Graham talks to Dr. Chilton who asks him whether he should call him “Dr. Graham”. Graham abnegates and tells him that he must see Lecktor in private and show him some photographs that might excite him. Dr. Chilton insists that Lecktor is only handed soft paper. Chilton then tries to interrogate Graham since he is the only person who ever understood Lecktor. Graham refuses to talk about Lecktor and insists on seeing him right now. A little intimidated, Chilton agrees and both leave the room. When Graham refers to himself as a layman, Lecktor is surprised by this since there are so many experts working for the police but only he managed to catch him. Lecktor asks Graham if he knows how he caught him, and when Graham asks back about what difference it makes, Lecktor answers that it makes no difference for himself, implying that is has meaning only for Graham's condition. Too bad that his part is missing in the Theatrical Version, because here Lecktor shows some of the brilliant psychologist he is supposed to be, acting a bit like in “The Silence of the Lambs”. In the Theatrical Version the pictures of the mutilated corpses that the child next to Graham sees lying in his lap are each shown longer. Altogether they are seen for about 3 Sec. in the Theatrical version and about 2 Sec. in the DC. As we see the camera pan through a hallway towards a door, it moves considerably faster in the DC, and the Theatrical version starts earlier as well. Graham's friend tells him that his wife will come to town since she has a day to spare. When he asks whether he has done something wrong, Graham abnegates. The camera zooms farther over the parking lot in the Theatrical Version. While in the Theatrical version the reporter is shown slides of the victims both alive and dead accompanied by the killer commenting on them, the DC only shows slides of the victims when they were still alive and without the narration. When the slide of Graham and the reporter is shown, both versions are identical again. So while the scene has little to no meaning in the DC, the Theatrical Version shows the reporter as well as us that he is supposed to be the next victim since a slide of him being alive is already added to the collection. In the Theatrical Version, stands a bit longer in the rain before opening the door. The van is seen a bit longer in the Theatrical Version. Graham's friend asks him about the mirrors, to which Graham replies that the killer uses them to see how it happens. The DC is missing the dialogue about the mirrors but a short shot (without dialogue) of Graham's friend is used that is not in the Theatrical Version. In the Theatrical Version we see Graham's friend longer before he stands up. The footage is the same, but a bit zoomed in in the DC. Graham's lines are identical, but rearranged. -	in the Director's Cut: 5 Sec. When Graham stops the tape as the dog walks through the door, the screen is seen 3 Sec. longer in the Theatrical Version. The whole 30 seconds long scene is completely rearranged but identical in content. The scenes even have the same running time in both versions. Nothing is missing in either version. In the Theatrical Version Graham's friend looks at him a bit longer, then goes back to the phone, ordering a helicopter to bring them into the city where the film laboratory is located. The DC cuts directly to the blind woman's house. Graham receives the fax about the killer before the co-pilot is seen telling them that they'll land soon. The Theatrical Version shows the cop putting the sheet of paper into the fax and pulling it out again. The Theatrical Version is cut a lot better and also more violent than the Director's Cut. The intercuts between Graham and the killer are a lot better than in the DC. Graham is lying on the floor as the killer unsuccessfully tries to shoot him. Graham shoots the killer in the leg. Up to here both versions are identical. The killer attempts to shoot again but is hit by a bullet from Graham and blood splatters onto the wall behind him – this is missing in the DC. The DC shows Graham shooting five times and the killer is hit three times. The Theatrical Version shows Graham shooting six times and the killer is hit five times. In the Theatrical version, Graham aims at the dead killer's head, then lowers the weapon and walks off – only then we see the outside of the house. In the Theatrical Version leads the blind woman out of the kitchen a bit earlier and they walk past the killer's body. The Director's Cut shows a car driving through the rain and parking in front of a house where a woman is busy in the kitchen when suddenly she is startled by the ringing doorbell. Her husband opens the door with a gun and Graham stands in the door. The family is a lot friendlier now and invites him in for a cup of coffee, but Graham says that he only wanted to see them. According to the audio commentary this is the Sherman family who were supposed to be the next victims and are very grateful because Graham saved them. In exchange, the Theatrical version features a brief scene in which graham is standing at the landing stage belonging to the killer's house, looking onto the water. His friend joins him after a moment.